There’s quite some sore taste after the first weekend of Euro 2016. Games are sold out and atmosphere in majority of cases is very festive. But incidents marred the first three days of the French tournament. Sadly, yesterday tragedy unfolded in Nice, where a 25-year-old Northern Ireland supporter was killed, having fallen 8 meters down from a bridge. But the series of bad news began long before opening game, on Thursday. 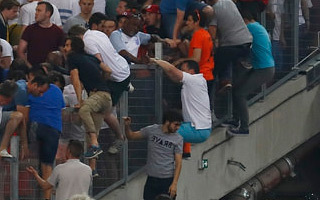 Several attacks on English supporters took place in Marseille. While not without provocation from the English, aggressors took part in large brawls, leaving many injured. To date 35 people have been confirmed injured over the last three days in Marseille alone. The prosecutor’s office of Marseille claims 7 English fans were hospitalized, though assistant chief constable Mark Roberts from England claims that number stands at 14. One person is in “critical but stable” condition after being attacked with iron bar. Largest amount of injuries comes from extremely violent attacks by organized groups of Russian hooligans. Armed with sticks and even knives they’ve attacked on several occasions. Just like with the number of people hospitalized, there’s discrepancy in estimates of their numbers. Marseille prosecutor Brice Robin claims there were 150 of them, while the English police operative gives 300 as the realistic number. Most grotesque scenes unveiled on Saturday night at Stade Vélodrome, when a portion of the Russian fanbase stormed sections occupied by international audience. Thousands rushed to the exits, some were crashed to the corner fencing, others salvaged themselves by jumping several meters down. Reaction of the stewards and security was delayed and chaotic. Apart from Marseille incidents of violence were reported in Paris, Nice and Lille. All cases involve public areas outside the stadiums, where it’s easiest for provocations to occur. It seems the only strategy of the police during these turbulent days was the use of tear gas, batons, rubber bullets water cannons and dogs. All of these measures have one thing in common: they don’t distinguish attackers from those attacked and may impact innocent people disproportionately more than those responsible for violence. This way police effectively become the third side of a brawl instead of neutralizing the two others. Geoff Pearson, British expert on matchday policing, witnessed some of the incidents that began in Marseille on Thursday. “It was the most predictable violence that I’ve seen since 2007 with Manchester United fans in Roma,” Pearson told the Guardian. It all began with fairly minor mutual provocations between the English and locals, which were met with disproportionate use of force by the police. “Your first interaction with a football fan shouldn’t be firing teargas or raising your baton. If you have not had some kind of positive engagement with them beforehand, you have failed in your job as a police officer.” he said. Pearson’s evaluation doesn’t concern attitudes of specific officers, but the overall approach that police force in France has. On Friday the expert suggested we would see further trouble if such approach is retained. And so we have. Similar criticism of the policing was expressed by Professor Clifford Stott. This safety expert drew many conclusions from the French 1998 World Cup, later ensuring safe Euros in Portugal and other countries by advising a softer, more proportionate approach. now he sees the French forces repeat the same mistakes they made in 1998. “There are many similarities between how the French police acted then and how they do now. French police seem to expect that English football fans will make trouble and so they have an aggressive attitude towards them from the beginning.” Stott said. His words were confirmed by numerous witness accounts, one of which was that making headlines by Rebekah Vardy, wife of English striker Jamie Vardy. She claimed the French police had been violent to supporters without any provocation on their part, using tear gas indiscriminately and treating spectators “like animals”. Whether you take the 150 or 300 estimate for how many thugs from Russia came, there’s no point in looking for Russians among those awaiting trial in France right now. The French police went as far as to raid hotels with Russian supporters to identify the aggressors, because they’ve failed to arrest them in direct aftermath of street or stadium riots. Over the last 3 days 116 people were arrested in Marseille, first five people already deported from France. 10 stand trial, majority of them English. But so far the greatest success in terms of punishment is 3 months in jail for a supporter who threw a plastic cup (or glass bottle, as argued by the prosecution) and “giving the finger” to police officers. No-one was arrested for the riots at Stade Vélodrome despite modern CCTV and aggressors having their faces uncovered. Two Russian fans were detained, but both for pitch invasion, as far we were able to establish. There is fear that certain level of nonchalance existed in French preparations to the policing of Euro 2016. Whether it was due to focus on anti-terrorism or not, the risk of violent thugs coming to France seems to have been underestimated. Geoff Pearson suggests that in the past French police officials were reluctant to use intelligence from their British counterparts. Identical suggestions come from our source within one of the national football federations, claiming the French organizers were acting as if they knew everything and refusing to accept suggestions for how the tournament might be improved. While reporting is necessary in cases like those over the weekend, there’s immense level of disinformation regarding events that unfolded particularly in Marseille. Mutually-excluding reports are why we haven’t published anything about the safety issues over the weekend. Perhaps most shockingly, numerous media outlets in Britain (though we’ve seen cases of that in other languages) rushed into blaming “The English Disease” for all violence, even when presenting photo/video evidence proving it wasn’t the English responsible for safety threats. The focus on violent incident makes one forget that they don’t even concern 1% of those visiting France and vast majority of tourists and French hosts are having a great time in peace, as seen below in this The Ball is Round photo. Disciplinary action against both the Russian and English federations is undergoing and if further violence occurs with their fanbases, they might face disqualification from the tournament. This step seems counterproductive not only because it’s another form of using collective responsibility and punishing thousands for the deeds of hundreds, at best. Those thousands of people have their trips and accommodation booked already and they’re still likely to stay in France. Meanwhile, Prof. Stott reminds UEFA that their decisions also contributed to the disorders over the weekend. After all it was UEFA who planned the England-Russia for Saturday evening, the worst possible time to police a high-risk game like this. “What risk assessment have they done?”, he asks. So far all host cities were asked to ban sale of alcohol in sensitive areas by the French interior ministry. While this surely won’t be a long-term solution, let’s hope the upcoming days will bring the much needed improvement in atmosphere around the tournament and safe experience for all fans!